As tailgating grows in popularity, the relationship between football and BBQ becomes even more evident. These days, competition quality Q can be found smoking in stadium parking lots all across the country. Saturday and Sunday afternoons have become showcases for pit masters to both feed and entertain fans before and after the big game. It's no surprise that football players sometimes get into BBQ as well. Ex Mississippi State standout and 13 year NFL pro, Reggie Kelly, is a prime example. After completing his football career, Reggie transitioned to the food business. Leaning on his Southern roots and love of cooking, Reggie Kelly started Kyvan Soul Food Selections (named after his children, Kyla and Kavan). Kyvan's product line includes several sauces (BBQ / Wing), spice rubs, salsas and fruit spreads. Since we try to focus primarily on BBQ, Reggie was kind enough to send me some of his Sweet BBQ Sauce to review. Kyvan sauces are packaged in 16 oz. plastic bottles. The color scheme and design is very similar for all of their sauces. The Kyvan logo is featured prominently (front and center) on each bottle. The sauce is a rich, dark brown in the bottle. It's consistency is "syrup like" and pours pretty quickly from the bottle. The label says "Sweet BBQ Sauce" and that's no lie. The tomato based sauce uses both brown and white sugar, along with HFCS, for a multi layered sweetness. Savory ingredients like onion and garlic are present, but don't quite balance the sweetness. There is also a significant smoke factor that was somewhat unexpected, but very enjoyable. When tasting the sauce, I also felt like their was a slight Polynesian note to the flavor that I couldn't quite place. Whatever it was, it worked well with the smokiness. As I've said time after time, I'm a sucker for a sweet BBQ sauce. It doesn't get much sweeter than Kyvan's. My family and I used Sweet BBQ Sauce a number of times as a dip and grilling glaze. It won rave reviews from everyone at the table. It was especially good on baby back ribs. The sauce brushed on smooth and glistened on the ribs as they finished grilling. All those sugars got even richer when heat was applied. 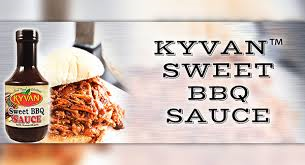 Kyvan's Sweet BBQ Sauce is an excellent compliment to ribs and chicken. It also works well as a dip for chicken fingers / nuggets. When using as a grilling glaze, it's important to be conscious of open flames because of the high sugar content. Sweet sauces will char in a hurry when near an open flame. Kvan Soul Food Selections can be found in Walmarts and several independent grocers throughout the South East. 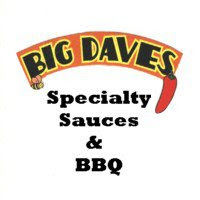 You can also purchase Sweet BBQ Sauce directly from the source at www.kyvan82.com . 0 Response to "Kyvan Sweet BBQ Sauce"